This introductory piano bundle gives you the Williams Allegro III paired with a ProLine PL100 keyboard stand for a ready to play package. The Williams Allegro III is an 88 weighted-key digital piano with superior sounds and breakthrough features that are ideal for the advancing student or the professional player who appreciates nuanced key control and high-quality sound. Taken from the Williams Custom Sound Library, it features 10 high-resolution sounds including Pianos, Electric Pianos, Organs, Strings and Bass, recorded using the finest instruments in the world with full dynamic ranges. The newly improved, weighted piano-action keyboard, allows for quick, responsive feel and control over the entire key range. The dual-driver speakers deliver all those lush tones with outstanding clarity and volume. Bluetooth MIDI functionality connects the Allegro III wirelessly to your iPhone or iPad to run iOS apps such as educational software like the McCarthy Music Teaching app. Plus, the Williams iOS app provides easy access to your Allegro III for adjusting sounds and controls as well as other features to improve your keyboard skills. The Allegro III can run on batteries or with the included AC power supply. The ProLine PL100 Keyboard Stand is a metal x-stand with a clutch mechanism that won’t wear out over time. 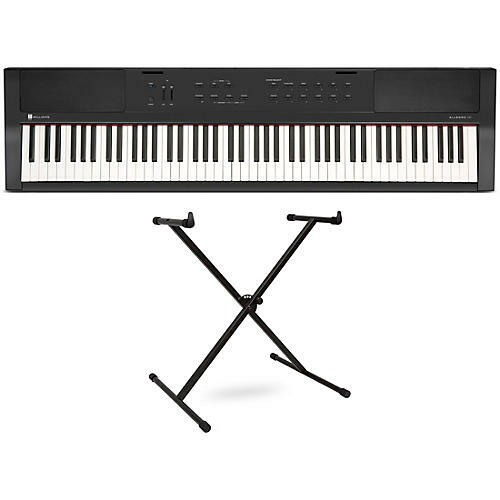 ProLine's sturdy keyboard stands support medium to full-sized keyboards, as well as DJ gear and mixers. Featuring unique, adjustable rubber feet for wobble-free stability and a knock-down design for a small footprint when disassembled, the PL100 will support your gear in the studio or on the road.